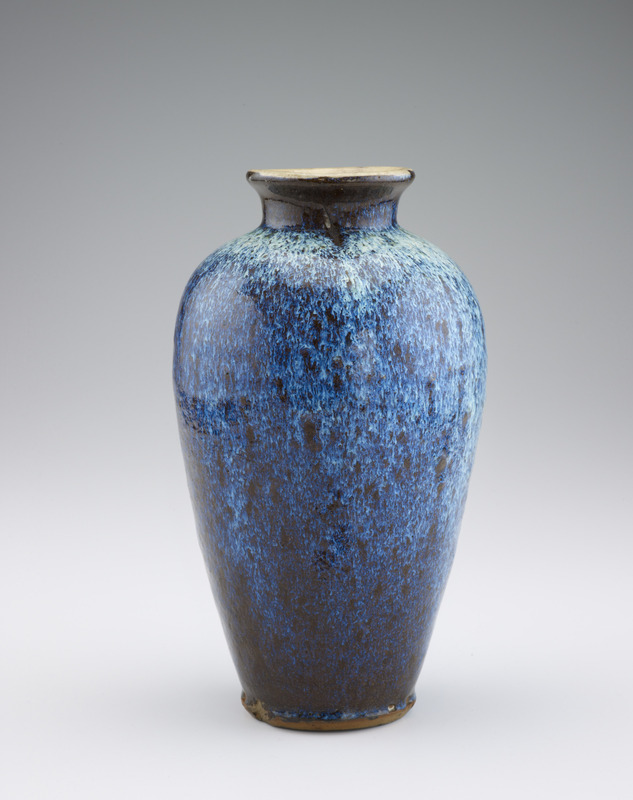 This vasecoated inside with white slip and then dipped, inside and out, into rice-straw ash glazeexhibits a range of blue tonalities on its exterior: cobalt blue where the glaze was thinly applied, pale blue where it was thicker (on the more horizontal surface of the shoulder). Freer purchased it during his 1907 trip to China. The following year, he displayed the vase in the Peacock Room with more than forty pieces of Jun or "Jun style" ware, massed to create a ceramic "harmony in blue" that resonated with Whistler's interior decoration, whose primary title was "Harmony in Blue and Gold." "Vase," in The Peacock Room, Freer Gallery of Art, Smithsonian Institution, Accession No. F1907.40a-b, Item #3262, http://peacockroom.wayne.edu/items/show/3262 (accessed April 22, 2019).